It’s not autumn. Still summer. 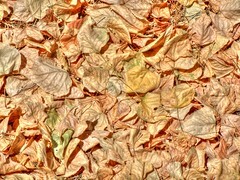 Leaves fall due to too much heat, being dried. Yet, thanks to wind, they gather together, creating some golden places. And us when we dry? It’s up to us. No es otoño. Todavía verano. Las hojas caen debido al calor excesivo, quedando secas. Aún, gracias al viento, se juntan creando lugares dorados. ¿Y nosotros, cuando nos secamos? Depende de nosotros. Uploaded by victor_nuno on 12 Aug ’06, 12.15pm CEST.